This collection is a pioneering effort to bring together in fruitful interaction the two dominant perspectives on social rules. 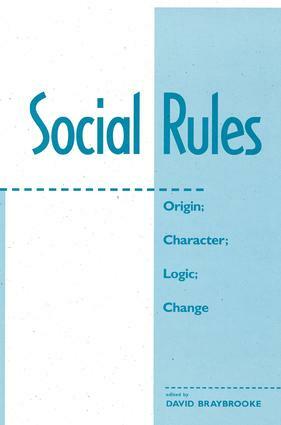 One, shared by philosophers, lawyers, anthropologists, and sociologists, directly invites formalization by a logic of rules. The other, originating with economists, emphasizes cost considerations and invites mathematical treatment, often in game-theoretical models for problems of coordination?models that some philosophers have taken up as well.Each perspective is represented by new and recent work that moves this important topic toward increased conceptual precision and deeper insight. As a whole, the collection strikes a balance between historical illustrations and theoretical argument, offering in both a rich body of suggestions for further work.